Summary and Definition: The industrious Crow were a nomadic tribe of hunters on the Great Plains. The Crow tribe strongly resisted the hostile incursions of neighboring Native Indian tribes encroaching on their territory. The Crow tribe acted as scouts for the US army during the Sioux Wars. The names of the most famous chiefs of the Crow tribe included Chief Plenty Coups, Chief Long Hair, Chief Sore Belly and Chief Bear Wolf. What was the lifestyle and culture of the Crow tribe? The Crow tribe were a nomadic group of hunters who roamed the Great Plains in search of buffalo. They were kin to the Hidatsa tribe. The Crow were known as notorious marauders and horse-stealers. They had no villages, except where they camped. The only crop raised by the tribe was tobacco which they traded along with buffalo hides and furs. In their own language, the Crow tribe call themselves Absaroka which means "Bird People." In sacred ceremonies the Crow did indeed wear dead birds on their head. The tribe was particularly noted for their long hair which trailed to the ground. The nomadic Crow tribe roamed through the Yellowstone River country of southern Montana to the Rocky Mountains; and southward through the mountains into the Wind River and Big Horn country of western Wyoming. The land of the Crow, and their enemies the Blackfoot tribe, overlapped in northern Montana and the two peoples were frequently at war. The Crow tribe were divided into three bands, with a dialect specific to each: the Kikatsa or Crows proper, the Ahnahaways, and the Allakaweah. 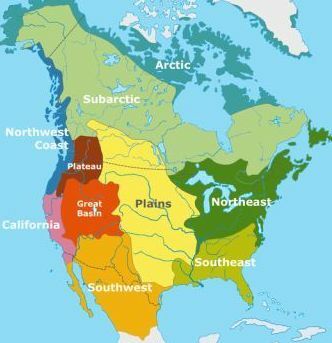 Where did the Crow tribe live? The Crow are people of the Great Plains Native American cultural group. The location of their tribal homelands are shown on the map. The geography of the region in which they lived dictated the lifestyle and culture of the Crow tribe. The clothes worn by the Crow men consisted of breechcloths in the summer and fringed buckskin tunics or shirts and leggings in the winter. Warm buffalo robes or cloaks were also worn to protect against inclement weather. The sun-bleached buffalo-robe clothing of the Crow tribe were the whitest, finest cloaks of all the Native Indian tribes. Some men of the Crow tribe, the "Bird People", wore a full bird as part of their headdress, usually for special ceremonies and rituals. This costume was probably part of the inspiration for the bird headdress worn by Johnny Depp as the Native Indian Tonto in the 2013 movie 'The Lone Ranger'. The normal type of headdress worn by the Crow were caps with straight-up eagle feathers. Elaborate feathered war bonnet with feathers trailing to the floor were also worn on special occasions. The men of the Crow tribe grew their hair for all their lives and it was so long that it swept the ground behind him. Every morning the men of the Crow tribe would oil their hair with bear's grease. The hair of Chief Long-hair measured ten feet, seven inches in length. For practical purposes for fighting and hunting his long hair would be pulled into a bun. According to the custom of the tribe in the time of mourning a warrior would cut off a number of locks of his long hair, as a sign of respect for the dead. This was a great honor as his hair was highly valued as his greatest ornament, which he had cultivated for the greater part of his life. The women of the Crow tribe were responsible for making the clothes worn by the people. Most items were sewn from soft, tanned skins of deer (buckskin) and buffalo. 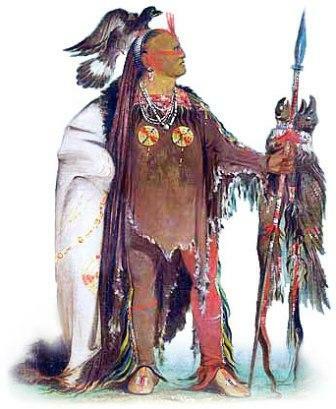 Clothes were often decorated with paint, porcupine quills or beadwork. Crow clothing for both men and women were adorned with paintings and decked ornaments, especially necklaces and earrings. What clothes did the Crow women wear? The type of clothes worn by the women of the Crow tribe were knee-length dresses and leggings. The women also wore the buffalo robes to keep warm and dry. Crow women wore their hair in two, thick braids decorated with beads. The clothing for both men and women of the tribe were painted with signs and symbols and decked with ornaments, especially necklaces and earrings. What did the Crow tribe live in? The Crow tribe lived in tent-like homes called tepees. The tepees were constructed using long wooden poles that were covered with animal skins such as buffalo hides which, like their clothes, were made from white, sun-bleached buffalo skins. The tepee tent was pyramid shaped, with flaps and openings. The tepee was rounded at the base and tapered to a narrow open smoke hole at the top. Most tepees were approximately 12 - 16 feet in diameter at the base. A hearth was built in the center of the tepee for heating and cooking. Howvere, the Crow tribe were known to erect huge tepees for their ceremonies, meetings and rituals. 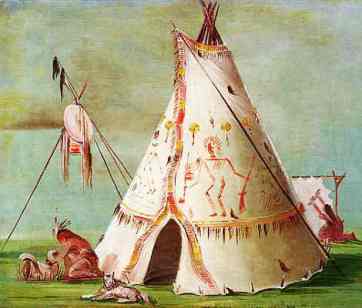 The tepee suited the nomadic lifestyle of the Crow tribe as it was quick to erect and easy to dismantle. The Crow tribe used Pictograms on their clothes and tepees to convey a story through pictures and symbols that represented physical objects, people and events. What did the Crow tribe eat? The food that the Crow tribe ate included the meat from all the game that was available in their vicinity: Buffalo, deer, elk, bear and wild turkey. The mainstay of their diet was supplemented with roots and wild vegetables such as spinach, prairie turnips and flavored with wild herbs. Wild berries and fruits were also added to the food available to the Crow. When animals for food was scarce the tribe ate pemmican, a form of dried buffalo meat. What weapons did the Crow use? The weapons used by the Crow tribe included bows and arrows, stone ball clubs, jaw bone clubs, hatchet axe, spears, lances and knives. War Shields were used on horseback as a means of defence. The rifle was added to their weapons with the advent of the white traders and settlers. What was the religion and beliefs of the Crow tribe? The religion and beliefs of the Crow tribe was based on Animism that encompassed the spiritual or religious idea that the universe and all natural objects animals, plants, trees, rivers, mountains rocks etc have souls or spirits. The Great Plains tribes such as the Crow believed in Manitou, the Great Spirit. What were the rituals and ceremonies of the Crow tribe? The rituals and ceremonies of the Crow tribe and many other Great Plains Native Indians, included the Sweat Lodge ceremony, the Vision Quest and the Sun Dance Ceremony. The sacred, ceremonial pipe (called a Calumet), was ritually filled with tobacco was passed among participants at all sacred ceremonies of the Crow. The Calumet, was often used to seal a peace treaty, hence the term 'Peace Pipe', but it was also used to offer prayers in religious ceremonies and in war councils. Who were the most famous leaders and chiefs of the Crow tribe? The most famous leaders and chiefs of the Crow tribe included Chief Long Hair, Chief Sore Belly, Chief Grizzly Bear, Chief Plenty Coups, Chief Medicine Crow, Iron Bull, Long Horse and Chief Bear Wolf. The greatest enemies of the Crow tribe were the Sioux and the Blackfoot tribes, and they became closely allied to the whites and acted as scouts for the US army. Due to their alliance with the whites they were put on a large reservation which, although progressively reduced in size, extends to nearly 6000 miles. The following history timeline details facts, dates and famous landmarks and battles fought by the Crow Nation. For additional facts and information refer to the legend and the Crow Story of Grizzly Bear.